Hotel Novotel Glasgow sits in a stylish modern build near Blythswood Square in the business district of the city centre. Close to several theatres and shopping streets, it makes a useful central place to stay. Also near the M8 motorway, it could hardly be easier to find. Rooms are stylish, with amenities expected in an AA 3-star hotel, and are available in Standard, Superior and Executive grades. Instead of heading into the city to try one of the many excellent restaurants and bars within walking distance, why not take advantage of the hospitality served in the hotel's Elements restaurant. Great news! Finding this page means you can now join our VIP list for Novotel Glasgow. 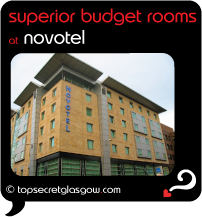 Grab your very own web page all about Novotel Glasgow. Do you have a special story about Hotel Novotel? A funny experience? A grand occasion? A funky photo? A personal tip? A top secret? Hotel Novotel Glasgow Centre has 24 hour front desk service.